The Importance of Strong Tree Root Systems | Mr. Tree, Inc.
A tree’s roots are vital in bringing nutrients and water to all other parts of the tree, anchoring the tree in the ground, determining its alignment, storing nutrients, and fighting off competition from other trees for the limited resources available. 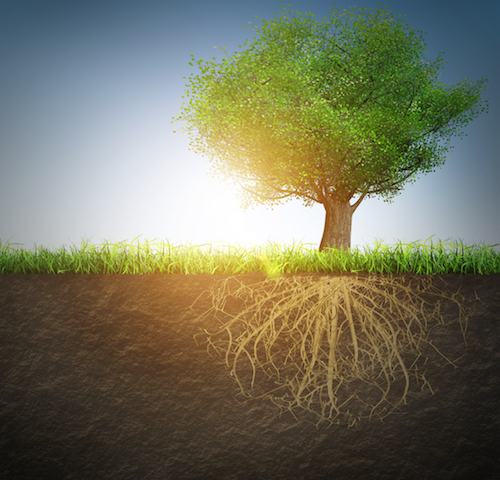 Tree roots can grow larger and wider underground than the tree’s entire canopy above the ground! Safeguarding and preserving the well-being of the root system of a tree is of the utmost importance in maintaining your landscape. A quick list of the most commonly-found Oregon trees includes the Douglas fir—the most prevalent tree type and the official tree of the state of Oregon—as well as the ponderosa pine, the red alder, the lodgepole pine, the grand fir, or the hemlock. Some of these trees are deciduous—meaning that they have leaves that are shed during the winter months—and some of these trees are evergreen—meaning that they lose their foliage in a way that makes them stay green all year round. There are also in-between trees called semi-deciduous, but they grow in tropical areas and aren’t found amongst Oregon trees. All of these prevalent tree species share an important common factor— an extensive root system. There are some obvious visual differences, and some important botanical ones, between the two tree types, but one thing that’s the same is that both kinds need protection and maintenance when they’re a part of your landscape. Deciduous trees usually need more nutrient-rich soil to thrive. When deciduous trees shed their leaves, the leaves compost around the base of the tree, bringing nutrients to the soil that the roots then feedback to the tree. Evergreen trees tend to be more hardy, able to thrive in much less-rich soils that have an acidic pH balance. Evergreens also usually need less water to stay healthy than deciduous trees do. What all this means for those who care for and enjoy Oregon trees is that the tree is already doing most of the work when it comes to nourishing itself and other nearby plant-life. A few simple maintenance and preventative measures can help ensure the long-term health and welfare of your family’s trees. It starts with a simple and important idea—what goes into the soil is what goes into the tree’s dinner. Soil that is too dry will slowly starve a tree; soil that is too wet can lead to rotting. Both conditions can make a tree more susceptible to disease and infestation. Mulching, when needed and done correctly, brings vital nutrients to the soil around the tree and holds in an appropriate amount of moisture. At the other end of the scale, clearing excess leaf litter in autumn is important for making sure the soil and roots of the tree don’t get too wet. If you have reason to think that the soil in your yard may have become contaminated somehow—for example, if some chemical solution or oil may have been spilled nearby—soil testing is available to determine what if anything is in the ground, and what the next steps are to correct the issue if one is identified. Then there are the roots themselves. A tree’s root system belongs under the ground, not resting on top of it. If your yard has suffered a loss of soil for some reason that has left a tree’s roots dangerously exposed, consult an Oregon arborist right away. Not only is the health of the tree at risk; the safety of anything or anyone around it is, too. Exposed roots mean that part of the tree’s stability has been compromised and it is likely to be dangerous or even structurally unsound. Having strong tree root systems means having underground tree root systems. If you see some root exposure and aren’t sure if something needs to be done to address it, contact us and we’ll be happy to examine the situation and discuss it with you. Some plants do have aerial roots, meaning that they are supposed to be above the ground and that the tree is healthy this way, but those are very unlikely to be found in this area. Strong tree root systems also play a very interesting role in shaping the environment around the tree. Trees are very competitive for access to the limited resources around. The toughest trees, with their robust roots bringing them the food and the stability they need to grow, will grow the healthiest and survive. Weaker trees will wither in the shadows of the canopies of the strong trees, unable to gather their share of the resources. The sturdiest trees, having outlasted and outgrown the competition, now have the chance to attempt vegetative reproduction. If successful, they will create descendants that will begin the fight for resources all over again. When your trees have their regular inspection by a professional, the roots are one of the areas that they’ll explore and test for health. One thing they will go over is what is going on around a tree that might impact its roots—are there other trees nearby? What other plants are in the area? Is the tree correctly vertically aligned? Is it placed so that it is expected to deal with a lot of strain? Finally, there is this question—is the root system of the tree the best that is can be, and getting the best treatment it can? If not, your arborist will begin a discussion about the best ways to strengthen the root system of the tree and maintain those gains throughout the life of the tree. Strong tree root systems represent an investment in your property, in the loveliness of Oregon trees, and the continued health of the plants in your landscape. These organic anchors and transport systems are what make it possible to have beautiful, beneficial trees near our homes and businesses, and in public parks. By treating the starting point of our trees right, we can ensure that they provide us with years of beauty, shade, fresh air, and increased property values.